Wait a minute...That was just last week you say? Well, if I didn't have this photo as proof that it was, in fact, warm enough to wear skirts without stockings and leave the apartment without a coat, I wouldn't believe it. Once again, Mother Nature has kicked us back to winter. Her belated Earth Day present to us I guess? Anyhow, I definitely borrowed, okay, stole the idea for this outfit from my friend Laura J. who was wearing similar colors in a similar way last week. My friends are so stylish! I seriously pick up some of the best fashion inspiration from my friends - that and a lot of online window shopping and magazine reading. So next time you have no clue what to wear, take a look around. You never know what might inspire you. Our weather has been cooler again too, though today we're getting some warmth again! Hopefully it'll spread out your way! I love the color of your shirt, it's super pretty! Ugh it is so cold here again too. Fingers crossed that we get the warm weather back in the Northeast! I hope you don't mind but I just stole this look from you (is that a double-steal?) by Pinning you to my Outfit Inspiration board. I just bought a silky top this same color from LOFT last week and I love the idea of it with a navy blazer and cream skirt! i wore an orange + navy + khaki/cream outfit combination last week, too. i really love those colors together, you look great! i hope some warmer weather is headed your way. Wow! 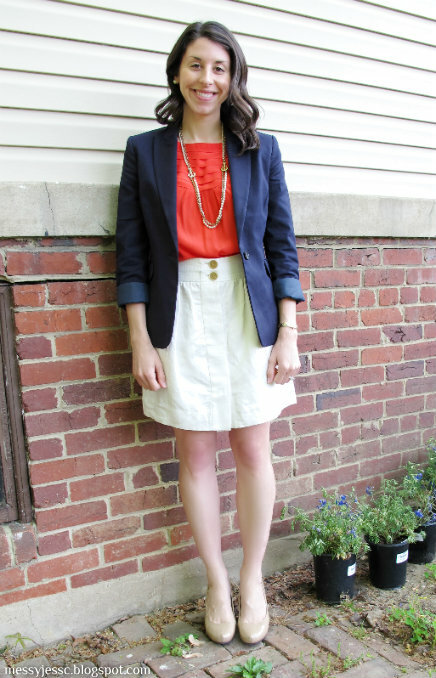 Love that blazer and skirt. Lovely! Thanks for visiting Messy Jess C. Catherine and for your comment. It made my day. Glad you like this look. Hope you have a great week!